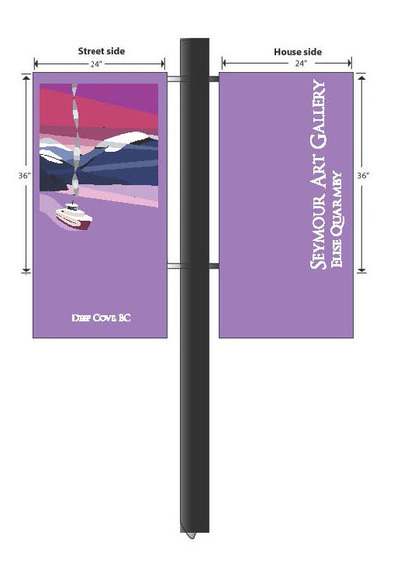 The Deep Cove Merchants Association along with the Seymour Art Gallery commissioned two designs for the summer 2014 and winter 2015 street banners through beautiful Deep Cove, BC. 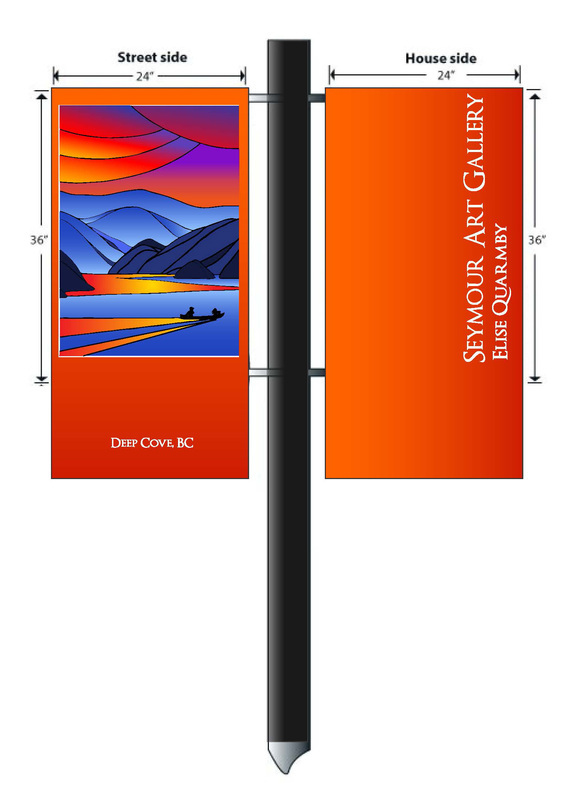 My design, Sunset Paddle was selected to be displayed throughout Deep Cove as part of the public art initiative to brighten the streets of this stunning west coast seaside community for the summer months. The summer and winter design (to be released fall 2015) were created with the purpose of inspiring in locals and visitors alike to explore the wild west coast. If you're visiting BC's coast this summer, Deep Cove is a fantastic place to start! NEW! 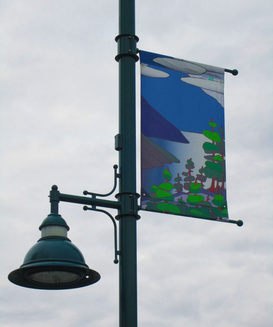 The second banner design, "Winter Morning" is now up along the streets of Deep Cove. This banner features my friend's labour of love, the Seashadow, as it drifts quietly across Indian Arm. 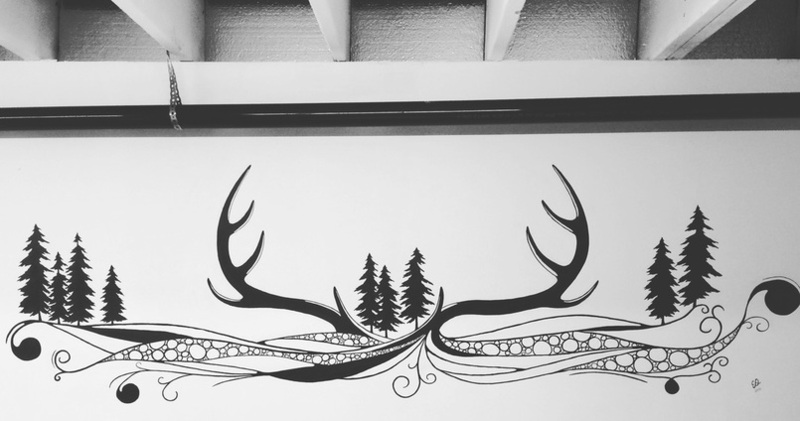 Cypress Mountain (West Vancouver, BC) commissioned an 18' x 3' mural to embellish an otherwise dreary-looking concrete wall in the Rental Facilities. The helpful Cypress staff plastered and primed the wall and I was able to complete most of the mural during one bright, snowy weekend in early November. The mural shows the stunning panorama view that Cypress Mountain night skiing is known for. As the sun sets in the west over Vancouver Island, the lights of downtown shine an orange glow across the water. Time for one more lap! 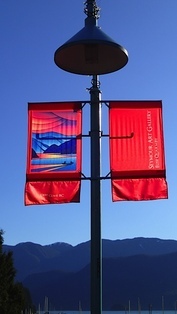 In September 2010, the City of the Arts (Port Moody, BC) called for artists to submit designs for the 2011-2012 StreetArts Artist-Designed Banner Project. Artists' submissions were encouraged to celebrate forests, and their importance in everyday life, based on the United Nations declaration that 2011 is the International Year of Forests. After careful thought and multiple design options, my final design, Coastal Connection, was selected by a panel of jurors. The banners were on display from April 2011 to October 2011 and will be up again next year along the major routes going in and out of Port Moody.